Costs on solar are coming down steeply, and now they're about to get even cheaper. A group of chemists at Ohio State University has invented a solar panel that stores energy without an external battery. The self-contained tuner/capacitor panels are already being licensed to industry. 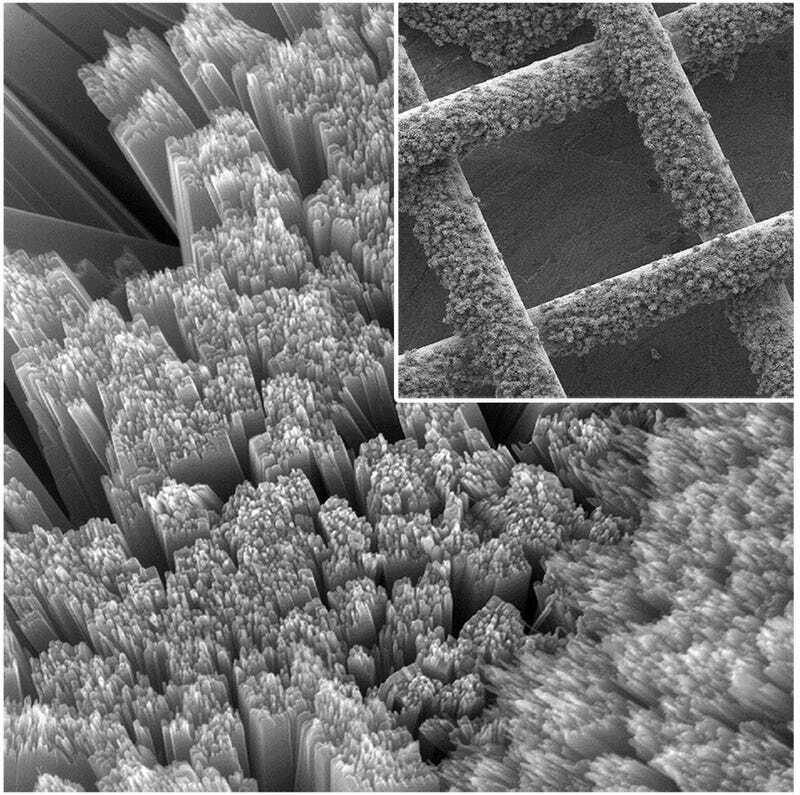 Above, you can see a scanning electron microscope image of the mesh solar panel, whose molecular structure allows oxygen to enter the device and assist in a chemical reaction that powers its onboard battery. In the October 3, 2014 issue of the journal Nature Communications, the researchers report that they've succeeded in combining a battery and a solar cell into one hybrid device. "The state of the art is to use a solar panel to capture the light, and then use a cheap battery to store the energy," Wu said. "We've integrated both functions into one device. Any time you can do that, you reduce cost. "The university will license the solar battery to industry, where Yiying Wu, professor of chemistry and biochemistry at Ohio State, says it will help tame the costs of renewable energy. "Basically, it's a breathing battery," Wu said. "It breathes in air when it discharges, and breathes out when it charges."